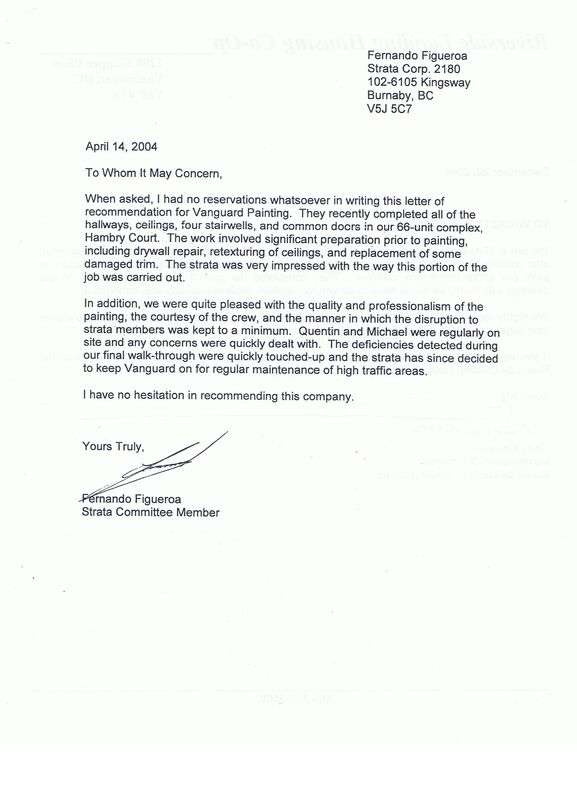 When asked, I had no reservations whatsoever in writing this letter of recommendation for Vanguard Painting. They recently completed all of the hallways, ceilings, four stairwells, and common doors in our 66-unit complex, Hambry Court… We were quite pleased with the quality and professionalism of the painting, the courtesy of the crew, and the manner in which the disruption to strata members was kept to a minimum. Quentin and Michael were regularly on site and any concerns were quickly dealt with. The deficiencies detected during our final walk-through were quickly touched-up and the strata has since decided to keep Vanguard on for regular maintenance of high traffic areas. I have no hesitation in recommending this company.